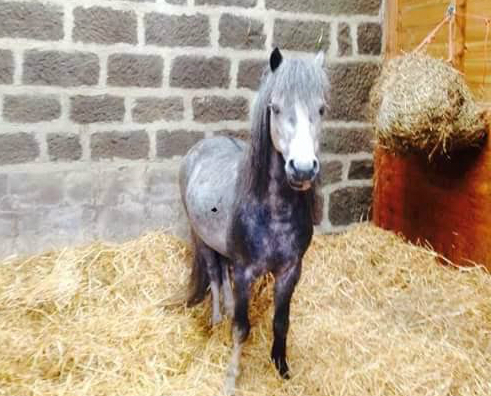 Rafael is a gorgeous and showy 8 year old grey Welsh Secion A gelding standing at 11.2hh pony. He is a project pony with lots of work still needed but since arriving with us early in 2015, Rafael has come along really well with many aspects of his handling. He is a smart pony and loves his clicker training sessions with his handler India, with who he has come along amazingly. Rafael really needs a home where his positive reinforcement training will be continued and developed and used to teach him to accept hoof handling and farrier work, de-spooking and confidence being In his own company or that of humans, rather than his herd. Rafael mixes with other geldings of a similar age, he's an active playful pony who would suit a pony with a similar personality. We really believe that with regular one to one training and handling from a dedicated trainer Rafael can become a well-educated and socialised pony and this could be a really rewarding foster project pony or ideally one for a forever home to focus on. Rafael is up to date with his vaccines, he’s microchipped, passported and wormed up to date.